Apple has filed a patent for a system that could project 3D images, as illustrated right here. On 20 March, the US Patent & Trademark Office published Apple’s new patent application for this next-gen 3D holographic-like display. The patent suggests that the technology could be applied to video conferencing, 3D modelling, forensic and scientific use, as well as the more obvious potential for entertainment uses. The patent also claims that users would not require 3D glasses or any additional headgear, as has previously been the case with most 3D imaging technologies to date. 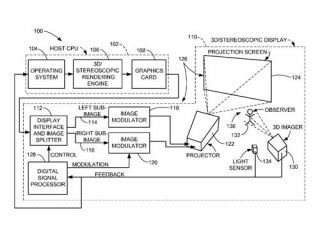 There's no timescale as to when we might expect to see Apple’s 3D projector, but we'll be sure to keep a close eye on this one. For the Apple fanboys out there who want to drool over a lengthy and detailed analysis of the patent, check out Mac NN.